A serious tool for a serious price that will pay back dividends in tracking, mixing and mastering. Massive range of artefact-free gain. Superb signal quality. High-quality design and build. 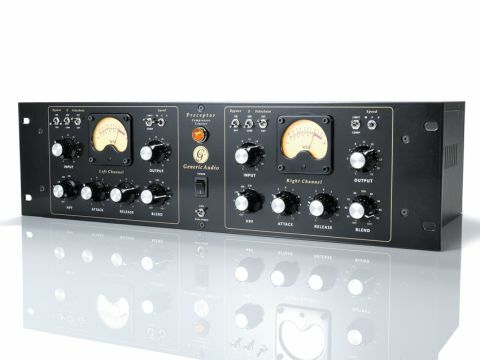 The Preceptor performs flawlessly as both a compressor and a limiter. The two channels can utilise completely separate settings. The Preceptor is unusually tall (3U) for a two-channel solid-state device, and though this extra headroom helps to accommodate the large power transformer, its most immediate beneﬁt is in the front-panel design, which offers plenty of tweaking room. The backlit VU meters not only show the gain reduction but they also indicate the bypass state, changing to an orange glow when active. "The more time we've spent with this unit, the more we've come to appreciate it across the board." As a 'boutique' product, this is a hand-assembled unit utilising no-expense spared components throughout: 21-position gold contact stepped attenuators, hand-matched Zener diodes and transistors, Carnhill input transformers, WIMA capacitors, and so on. There are no continuous controls and so all settings can be recalled exactly, which makes the unit a candidate for mastering applications as well as tracking and mixing. Generic Audio states that differences between the two channels are kept to a maximum of +/-0.1dB, which is no mean feat. GA hasn't skimped on the power supply either, using a bespoke AC transformer (preceded by an EMI ﬁlter) to supply ﬁve separate voltages for the various circuit blocks, each of which is stabilised to within +/-0.01V. This is crosses the borderline of obsessive, which in this context is rarely a bad thing. The XLR inputs and outputs at the rear are accompanied by two TRS sockets for sidechain input. The sidechain selection toggle sits next to the bypass and input Z (impedance) switches at the top of each channel with two more toggle switches ﬂanking each VU meter controlling compression/limiting behaviour and overall attack/release speed (F, M, S). Below the input and output controls are four more stepped rotary switches: HPF, attack, release and blend. The former engages the sidechain high-pass ﬁlter (internal and external) with ﬁve cutoff frequencies (40, 80, 120, 200 and 320Hz). The attack and release controls provide 11 steps with automatic options at the end of the dial. The 11-position Blend knob mixes compressed and uncompressed signals in 10% steps. Unlike many designs that use one channel as 'master' in linked stereo mode, the Preceptor only links the sidechain input (i.e. sums the two channels) allowing completely independent channel settings. This is a far preferable approach in our opinion, allowing for much more scope in tracking, mixing and mastering. As the Preceptor does not feature a Threshold control, the input knob effectively dials in the compression/limiting click by click. With relatively hot signals, the gain reduction meter starts dipping at the lowest input gain setting (ﬁrst click up) and means you are straight into compression, though it is very subtle. 1200 tap from the transformer instead of 300. The output gain provides plenty of compensation for brutal gain reduction and with seemingly untouchable headroom. Many devices boast higher maximum I/O ﬁgures and yet are easier to distort, so if you're a dBu spec hound don't be fooled: this is one roomy compressor. The Preceptor is impressively transparent and capable of adding density to a source in a ﬂattering and musical way. Its effect is not necessarily invisible as it can easily pump like hell and remove any trace of transient life if you want it to, but it never sounds trashy or out of control. The automatic response settings are well set up and make an excellent starting point, as well as coping extremely well with temporally complex sources such as stereo mixes and group busses. The more time we've spent with this unit the more we've come to appreciate its abilities across the board, from instrument tracking and transient shaping (meaty drums to die for) to mix-buss and mastering duties. For drum mixes and full stereo mixes in particular the HPF delivers all the low end back when you think you've gone a bit overboard with the dynamic range squeeze, allowing a healthy bass drum pump without killing the mids and tops. Though we tended to use the compression setting more than limiting, the Preceptor performs ﬂawlessly in both, with the limiting producing a more aggressive biting characteristic. The compression is like brown sugar and can just be poured on endlessly - only when a rush of hiss comes in from the source tailing off do you realise quite how far you've gone. The Blend function is essential with this kind of compressor/limiter and allows for some stunning parallel 'beef-ups' for all sources. With 'boutique' gear there's always the elephant in the room, and that is the price - which in this case puts the Preceptor shoulder to shoulder with the real big hitters. The quality of the components and workmanship ﬁt the (quite considerable) bill and the quality of signal path (exceptional low self noise and high headroom) in conjunction with the all-stepped controls make it a prime mastering candidate, a factor that always adds a premium. The range of dynamic range manipulations this unit easily provides make it a highly ﬂexible tool that can deliver excellent results in tracking, mixing and mastering environments. We were particularly impressed by the lack of tonal colouring, a characteristic that is highly desirable and keeps it out of the one-trick-pony league. The Preceptor is wide-ranging and yet deﬁnitively non-generic - this is what 'boutique' gear should be about.